In the third and final part of my series I would like to focus on a couple other places in our home that the Montessori Method has helped us. These little things seems to add a consistency to our home and helps our children know what to expect throughout the house. 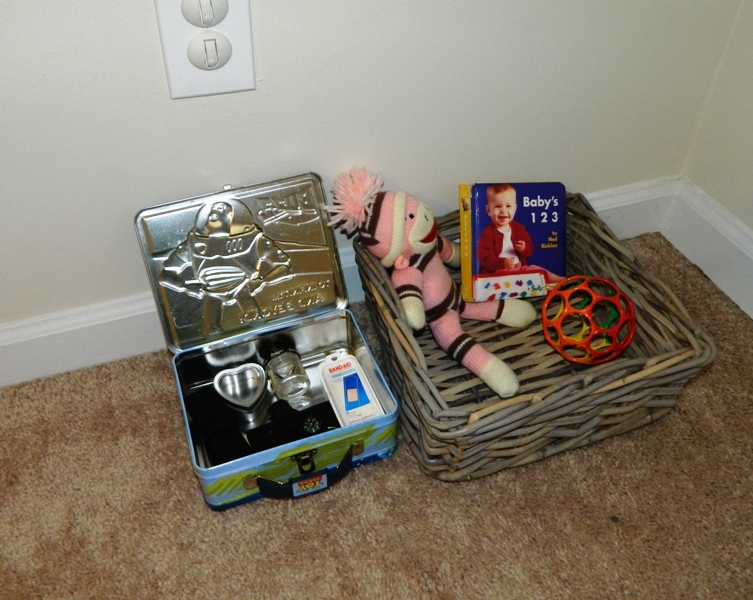 We try to implement these same activities and set ups every time we move. It makes a new place seem like home much faster. This stool is used more than any other piece of furniture we have for the kids. Since Sam was able to walk he has moved this step stool around to be able to interact with us and provide for himself many of his needs. 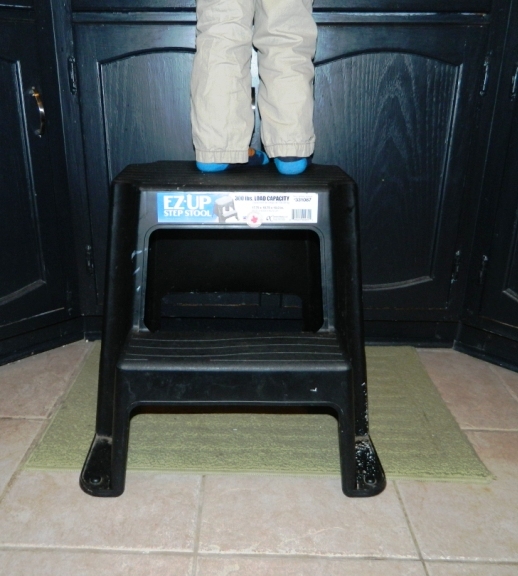 It is a painting step stool we bought from Lowe's Home Improvement for about $15. It has surpassed any expectations we had for it. It is plastic and lightweight; so Samuel is able to move it around without any problem. 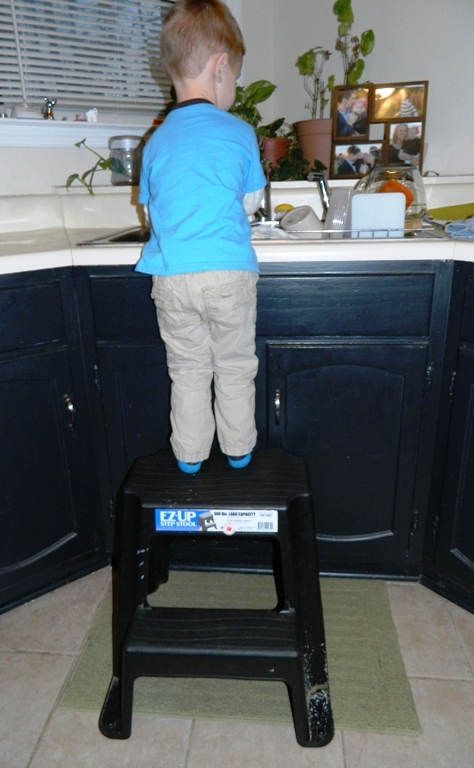 The two steps helped him, when he was still small, to get all the way to the counter and the wide base is a sturdy platform for him to stand on. Now that Avalyn is pulling up, she is often perched on the bottom step watching her bother and getting a new perspective on the world around her. This is a low cabinet in our kitchen that is set up for the kids. Snacks on the left are at the disposal of Samuel. He can come and get a snack whenever he feels he needs something. The basket next to those snacks holds his silverware. The plates on the bottom of the cabinet are from Target. I found them on one of the back aisles when they mark things down. Having cheap glass plates has helped Samuel to understand to be careful with his things, while giving me a piece of mind that they were only a couple dollars, so no worries if accidents happen. I found the drinking glasses at an antiques store for cheap. They are small enough that Ava has no problem holding them to drink her juice with dinner. Setting up this cabinet is one of the first choices I make when we get to a new place. 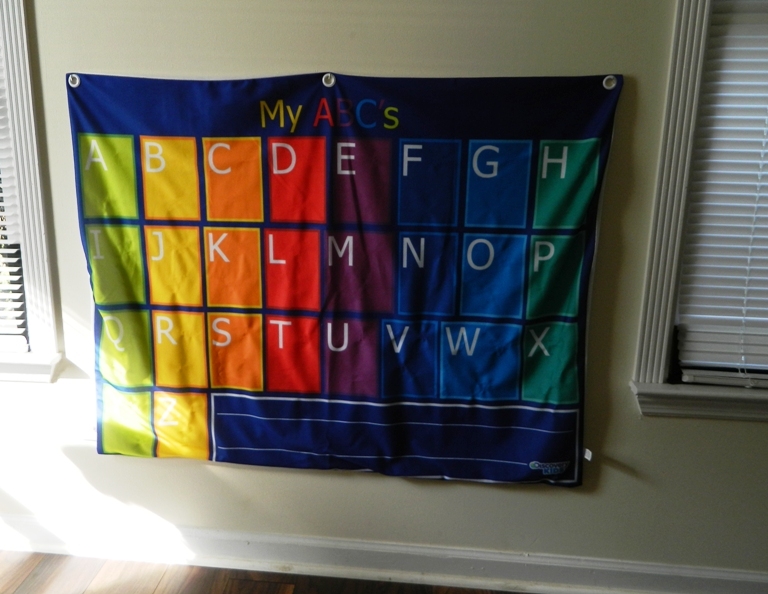 Having something accessible for the children is important and helps them to know where to go for their things. Samuel sets the table by having access to the counter for napkins and the silverware drawer. He also has access to any other drawers and cabinets for utensils or bowls he would like to use while cooking. We have a jar on our counter with wooden spoons, rubber spatulas, and a drawer with just whisks, a potato peeler, a garlic press, and spatulas. He is welcome to it all. He can open and close the refrigerator to make his own PB&J (his all time favorite) and is the best kitchen helper I have ever had! There are few places in our kitchen the kids have been taught they are not welcome to access. One is under the sink where we keep cleaning materials. (I home make all of our cleaning solutions, but in other peoples' houses this is not the case, so consistency is our aim with this restriction.) Another place is the knife blocks we have on the counter. The last the the stove. Common sense there. This is a corner in our living room. Two windows in a corner helps to have great light in the afternoon. Currently, in our toy swap, we have musical instruments and our alphabet felt mat. Avalyn likes the colors of our little piano (another grandparent gift) and the chair. We added a working analog clock at kid level and talk about what time it is when we are in this room. The picture is interesting, it depicts an old man, who could be Einstein, feeding pigeons in a park. Samuel likes to talk about what is going on in the picture and how many pigeons he can count. I like to switch this picture out throughout the year (or house depending) and we can use our imagination on what the story behind the picture might be. This activity was a Groupon find. The felt alphabet has a whole series of lower case letters as well as alphabet pictures that can be Velcro'ed to the mat. Samuel has access to the box with those pieces and loves matching the lower case with the upper case. It will be very easy to add on to this activity with cursive letters or different pictures. 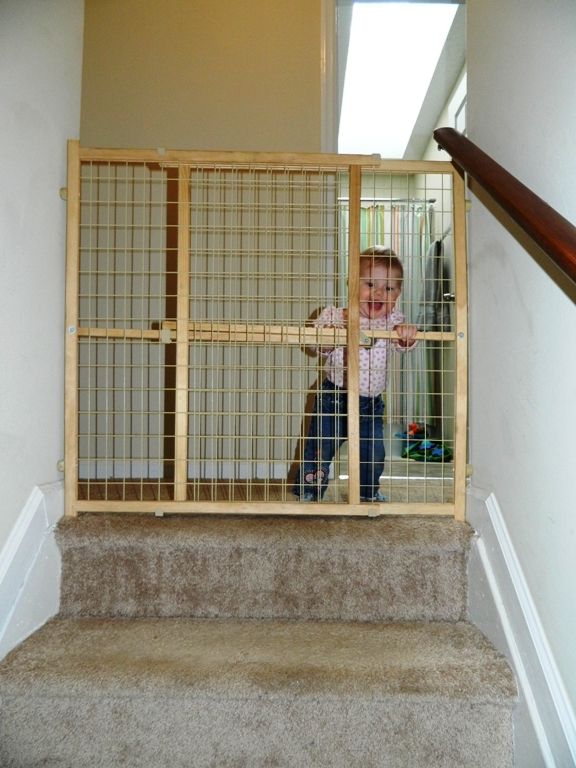 The most important safety feature we have in our home is a baby gate. Not all of our houses have had stairs, but when they do we are ready. Samuel has no problem negotiating any stairs and actually learned on a very steep set of wooden stairs we had in one of our houses in NY. Avalyn has been working on her stair negotiation, but still has some learning to do before we will feel comfortable for her to be on her own. We put the gate up at night regardless of how proficient the kids are. Groggy kiddos falling down a set of stairs in the middle of the night is not something I want to worry about. This gate is the cheapest we could find at Walmart. It has adjusted to any and all places we have needed it and is sturdy enough that any wiggling and banging on by the kids doesn't budge it. 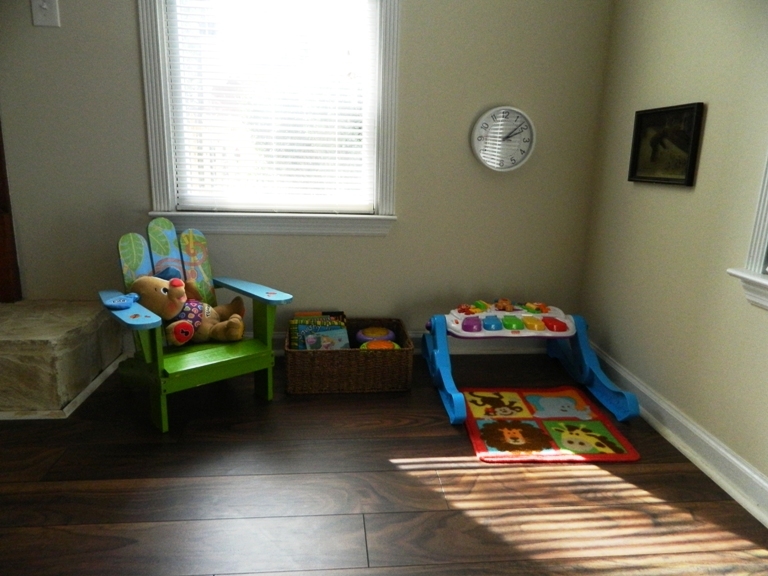 ﻿We have a small corner in our master bedroom for a couple of things for the kids. Baskets are something I always have my eye out for. I just found this one as a set of 3 in a little general store on one of our adventures a couple weekends ago. Great sturdy baskets for a good price. Can't beat it! This is "The Buzz Box". When Samuel started moving around on his own and wanted to explore everything, I put together this little box to keep in our bathroom. It is an activity the kids can do while I take a shower and get ready. 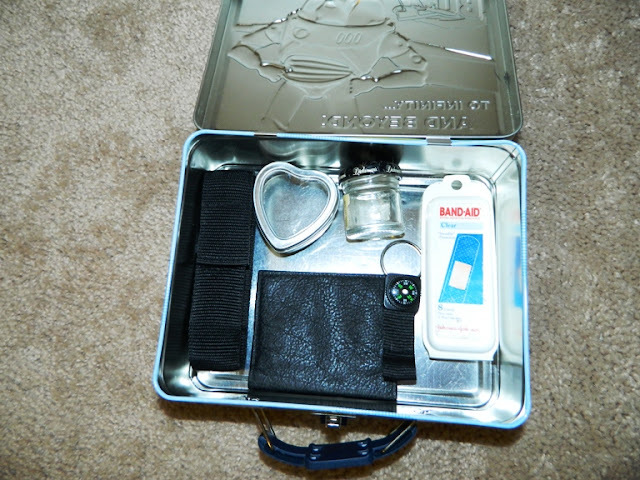 It just so happens to be in a Buzz Lightyear tin lunch box. 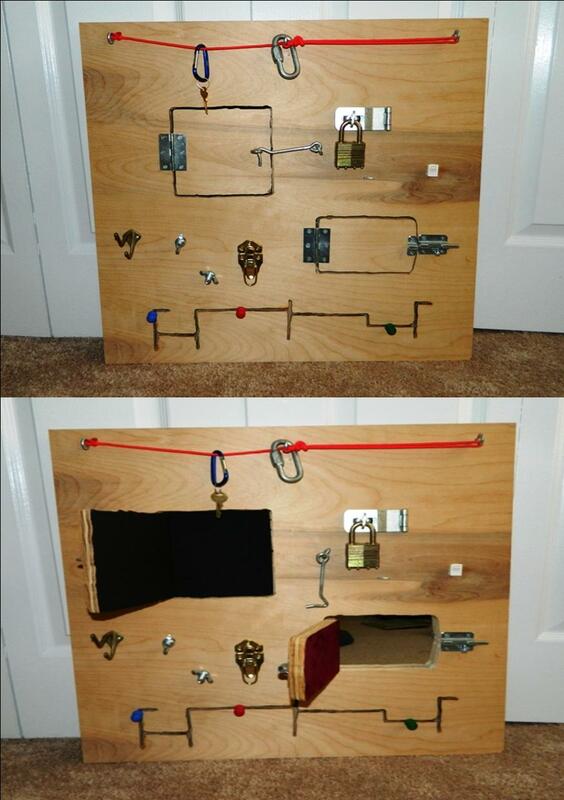 It has a latch which is the first fine motor skill either of the kids have to work through to get in. Inside is a set of different open and close containers. A small Velcro pouch. A heart shaped little box. A small twist top jelly jar. A travel size Band Aid container. A compass on a key ring and a wallet with plastic sheets inside. Before Avalyn was able explore, there were sea shells inside some of the containers or bead necklaces. For safety those are no longer in our box. All of these activities you can find around your house. Or you can rummage through one of the grandparent's houses or a yard sale. Cheap, easy, and entertaining for the times where you need just a couple more minutes to get yourself together. This activity board is currently phased out of our toys since it was up for the entire time we were in the last house, but I love it to much not to share. My husband and I made it off of a model from this website. It is by no means perfect and VERY homemade. We used Grandma donated old latches, screws, bolts, and hinges. Painted with paints from our craft box and used homemade chalkboard paint. Samuel loves this board, but some of the wing nuts are a little small for Avalyn for right now. We will let it rest for a while longer and put it up again when she is ready. 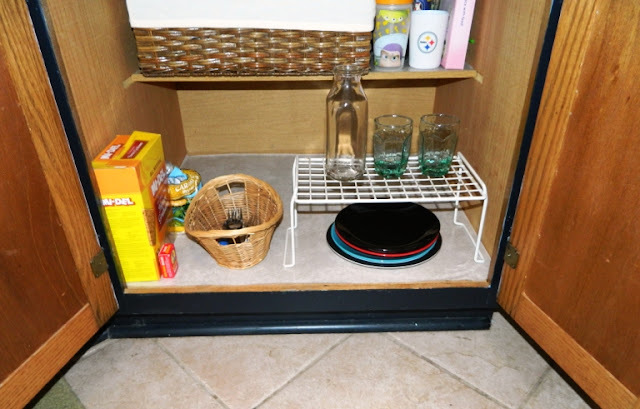 I hope that sharing how we have set up some areas in our home will give you some ideas about what you might be able to do in your own home (Check out Part 1 and Part 2!). Lisa is a wealth of knowledge and has many free materials as well as her own programs at Montessori for the Earth. 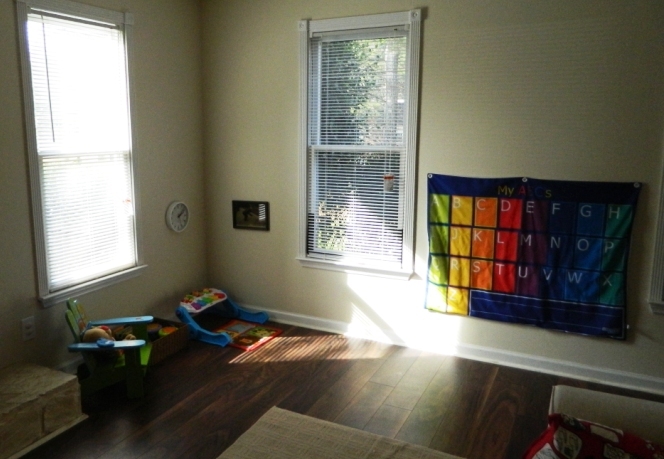 We used her 0-24 month program to get our foot in the door to the Montessori Method. There are also many great books out there that can help you in your journey into the Montessori world. 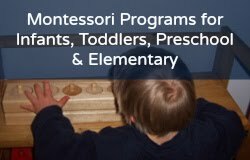 Not to mention the great community of people willing and excited to talk with you about how to do Montessori on a budget.